After a motorcycle accident left him with a shattered knee, the doctors told Osvaldo he'd never be active again. Learn how he dropped his crutches, proved the doctors wrong, and built a stronger, healthier body. I've always been a skinny guy. I started training in my teens, but I was never serious. I slacked on my workouts. Even as an adult, I used my full-time job as an excuse to make the gym a small priority. In February of 2009 I was in a motorcycle accident and broke my left knee. I had to undergo several major surgeries. At one point the doctor came into the room, approached my bed and said, "You have to be aware now that your life will never be the same. You won't be able to do things like run, jump, or train with weights." As you can imagine, this was not easy to hear. Tears started rolling down my face. After the operation, my self-esteem was at an all-time low. My whole perspective was negative. I started gaining weight. Then one day it hit me: I didn't want to live according to what someone said I could or couldn't do. I wanted to live life on my terms. I started going to the gym, even on my crutches. I worked out carefully. Little by little, I felt better about myself and saw improvements in my physique. 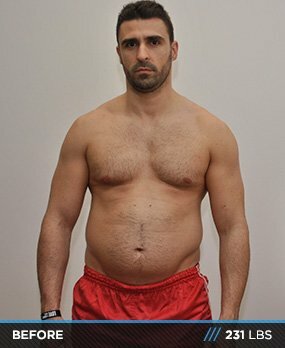 I stumbled upon the Bodybuilding.com Transformation Challenge by accident. While scrolling around the site, which I did often, I saw the challenge and asked myself "Why not?" 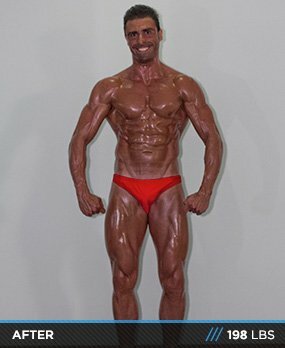 I registered and started training immediately, focusing on the final goal of building the best possible physique of my life. Since that day, I've made my fitness a priority. I'm happier, healthier, and have a much brighter perspective on my life. Supplements are a small yet important part of my training. The key is choosing the correct ones for your goals. I stuck to the basics and tried not to overdo it. My diet consisted of basic, clean foods during the transformation. I ate 6-8 times per day, three of which were supplements or shakes. I stayed on a schedule, eating every 2-3 hours. My primary protein sources were fish, chicken or turkey breast, eggs, and whey supplements. My carbs came mainly from oats, sweet potatoes, and white rice for more complex carbs. For simple carbs, I ate fruits like bananas and dates. I stuck with nuts, olive oil, and avocado to reach my fat macros. I sometimes work a lagging body part. Kai Greene says, "Mind is everything." Despite what anyone may say, you are the true maker of your life and destiny. It is never too late to make a change happen. Do not lose focus and determination. Believe in yourself always. The island of Madeira is at the top of a massive shield volcano that rises 3.7 miles (6 kilometers) from the floor of the Atlantic Ocean. The island is best known for its landscapes. It's beautiful, always sunny, and the weather is hot. Madeira is also home to soccer great Cristiano Ronaldo. He was born and started his career here. The area is well-known for its walking, hiking, and gastronomy. The sport of bodybuilding is not huge over here, but it does have its followers and enthusiasts.